As you can imagine, Tawny Nurse Sharks love the tropical and subtropical water of coral reefs. They are mostly found in the Indian and Pacific Oceans as well as in Japanese Waters and the Mediterranean Sea. Normally, they are seen in shallow water near the surface and don’t seem to go deeper than 80 metres. 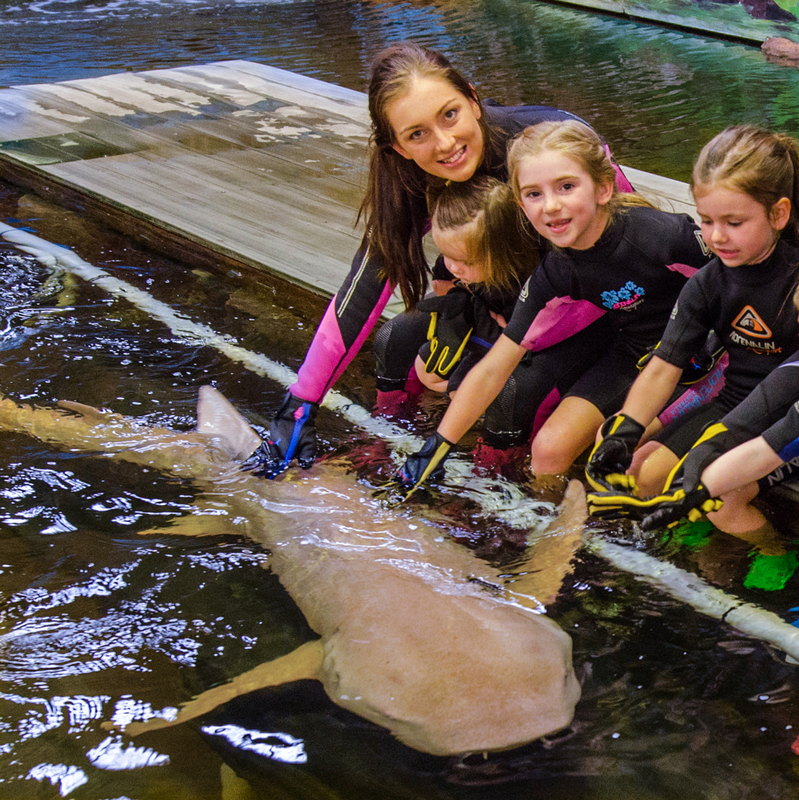 This exhibit is your chance to walk into the water to interact with our 3 metre Tawny Nurse sharks and other tropical species. During our tour we will also experience these animals feeding up-close producing an incredible suction force as they feed. Are sharks as scary as some people think? Find the answer to these questions and more during our tour. You may find yourself looking at these animals in a whole new light. From the spectacular Leopard Whip Rays to robust Tawny Nurse Sharks. Some of the exhibit highlights include a demonstration of a 2,7 metre Tawny Nurse Shark and his incredible force suction eating abilities and the intelligence of this majestic animal. Many fishes in this exhibit face threats in the wild: sharks populations have been devastated from shark finning/ overfishing and poor legislative requirements on commercial fishing. This encounter will highlight the concerns of shark meat and its use as symbol in some cultures. An array of studies have shown us that shark meat is loaded with harmful metals and shark fin soup has also been linked to a reduction in human male fertility. Recent tests have found flake fish and chips (Shark) for sale on the shelves in Australia is 3 times over the legal limit of heavy metals like mercury. Sharks and Rays are not fit for human consumption and at the same time are unsustainable as they are a key apex predator, long lived and have only a small number of offspring. If we spread awareness together we can show the Australian government we want stronger labeling requirements of the shark fishing industry so we can be aware of what we are actually consuming. Download this app to help you make sustainable healthy choices when ordering your seafood.